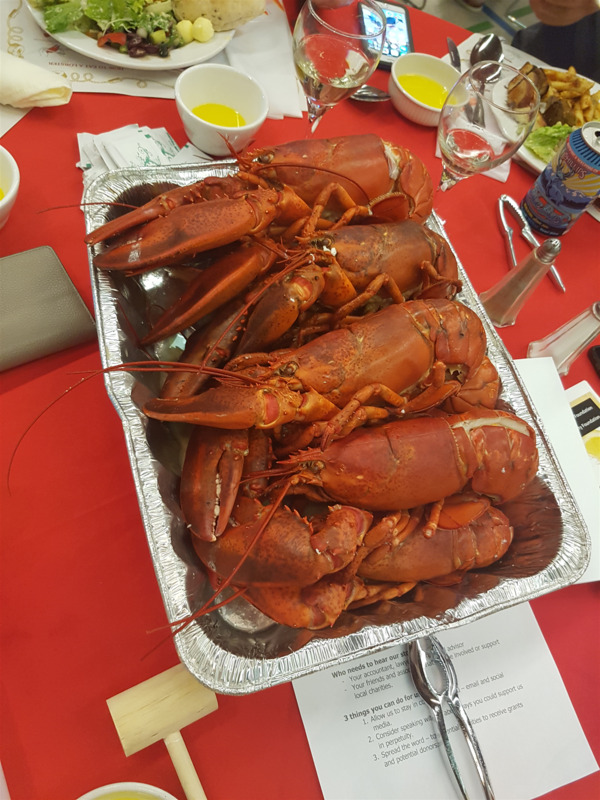 Our 7th annual Lobsterfest community fundraiser is officially set for June 15, 2019 at the Mary Winspear Centre in Sidney and tickets are now available for purchase. Tickets cost $100 each and come with a partial tax receipt issued after the event. Early Bird tickets are available until May 15, 2019 for $90 each. This event always sells out so if you are interested in purchasing tickets please contact us for details! This year the Rotary Club’s share of the silent auction proceeds will be donated to the Saanichton Village Association and used to fund its Bike n’ Ride project to be constructed on Mt. Newton X Road. Once complete, the bike shelters, bike lockers and community benches will be used by commuters, locals who want to shop without their cars, and cyclists who want to stop for a rest.This year the Rotary Club’s share of the silent auction proceeds will be donated to the Saanichton Village Association and used to fund its Bike n’ Ride project to be constructed on Mt. Newton X Road. Once complete, the bike shelters, bike lockers and community benches will be used by commuters, locals who want to shop without their cars, and cyclists who want to stop for a rest. Mark your calendars! 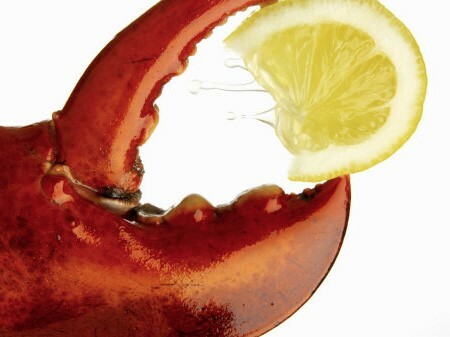 Our 7th Annual Lobsterfest is being held on Saturday, June 15, 2019 at the Mary Winspear Centre. Tickets on sale soon ... keep checking back for details! Brentwood Bay Rotary Club following the theft of hers at the Brentwood Bay Days Parade. Canadian Tire even donated a new helmet. Happy trails Taylor! Members from several Victoria area clubs came together at Island View Beach on Saturday March 25, 2017 to bring awareness to the work being done to end polio. 2016 was our must successful Lobsterfest to day. A huge 'Thank You!!' goes out to the volunteers from Coast Capitol Saanichton and Rotaract Victoria. Without their help we definitely could not have pulled off such an enjoyable night. We also want to acknowledge Symphony Vineyards for providing the wine and being there to offer tastings to our guests - even keeping the white wine at the perfect temperature despite the warm evening! Thank you to the business owners and inviduals who donated more than $16000 worth of auction items. And a great big thanks to all the attendees. We will ensure every penny raised at this event goes to support worthwhile causes. Thank you to all who came out to participate in the Shoreline clean up at Island View Beach on Saturday March 13th. It was a beautiful day to be outside and it was shocking how much garbage we found. 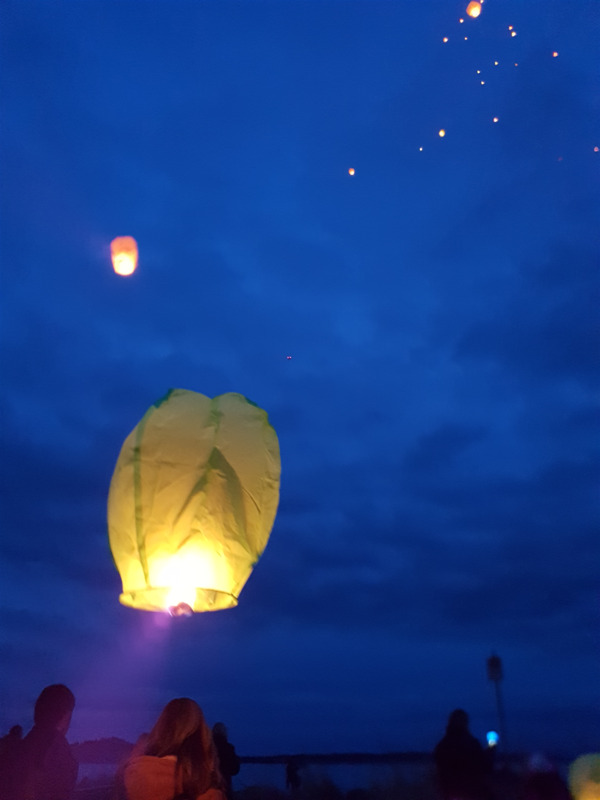 Hopefully we can make this an annual event! Special thank you to the members of the Royal Oak Rotary Club who made it out. Following a very inspiring talk, the Rotary Club of Brentwood Bay presented a cheque for $1000 to support Dr. Ambrose Marsh and his team in their Bombo Palliative Care project. They were also selling some awesome African print placemats, but Elaine snatched them all up. If you get a chance, buy some before Elaine finds them! Our club was thrilled to present a cheque for $15,000 to Mike Nicols in support of his Seven Ravens Permaculture project in Africa. Since 1988, Seven Ravens Farm has been run as a Permaculture Farm and Eco Forest on Salt Spring Island as a home base to spread the knowledge of permaculture all over the world. For more information on the work Mike and his team do, see their website. We would like to thank the more than 250 people who attended Lobsterfest this year. The event was a huge success and comments have been very positive. Thank you also to the Rotaract and Royal Bank volunteers who kept things flowing as smoothly as possible. The event would not have been the financial success that it was with out the support of our many sponsors and donars. If you want to be sure to get your ticket for next year, like our facebook page to be kept up to date. 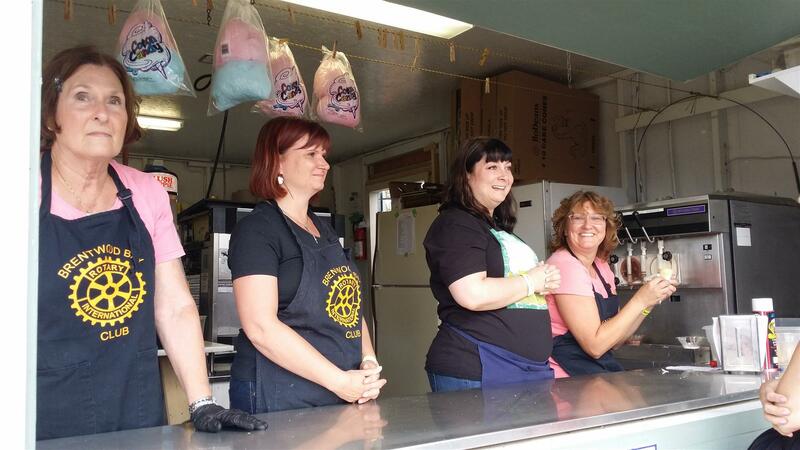 We were lucky to have a wealth of volunteers help out at our booth at the Saanich Fall Fair again this year. This is one of the clubs main sources of funds and would not be nearly the success that it is without the support of our friends and family. Countless ice cream cones and many a bag of cotton candy were enjoyed over the weekend thanks to you. Our thanks to all those who showed up! 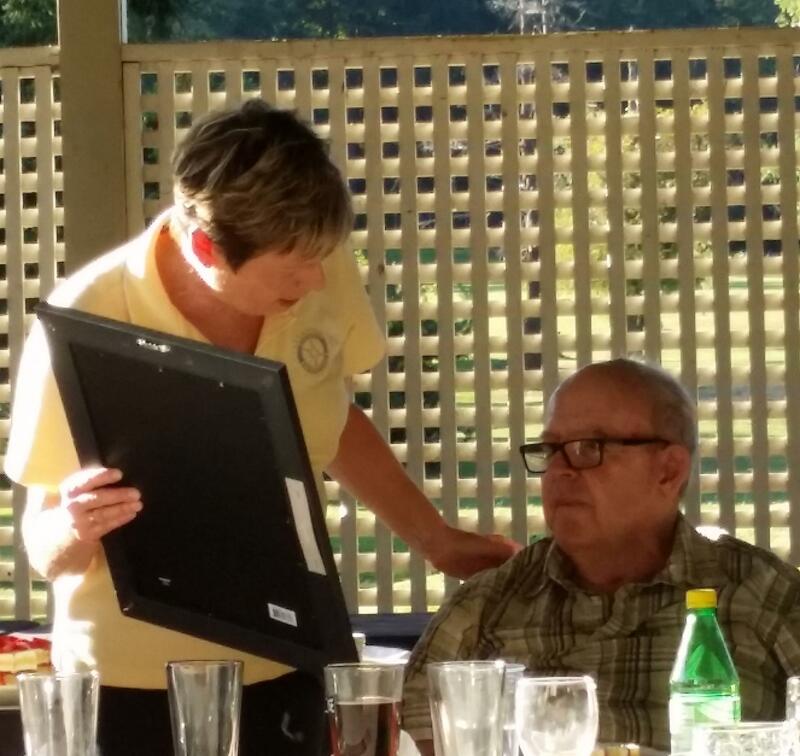 George Lawson was awarded Honourary Membership, one of the highest honours bestowed in Rotary, on August 5th. 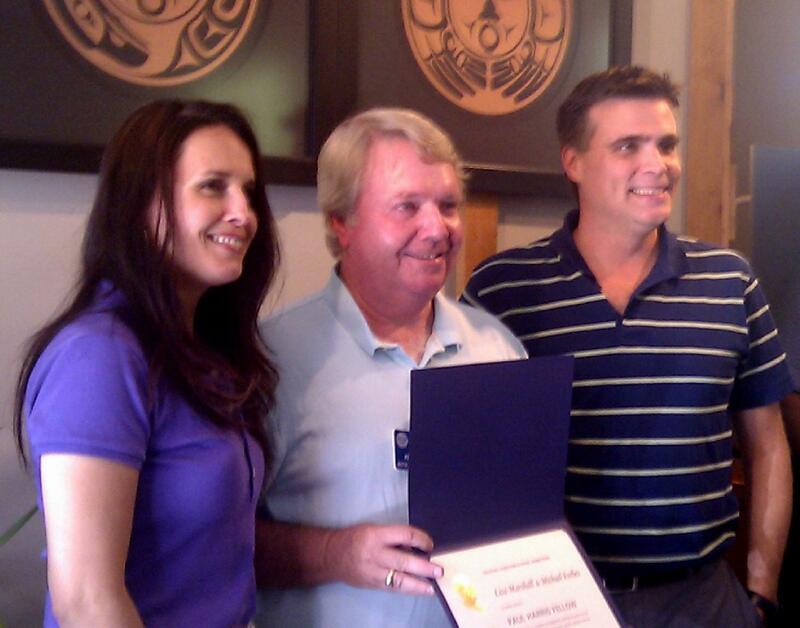 George, a retired municipal police officer, joined the Rotary Club of Brentwood Bay in 1984. During his 30 years as a Rotarian George not only served as president and is a Paul Harris Fellow, but was also integral in proposing many new members. Thank you for your significant contributions to the Rotary Club of Brentwood Bay. Volunteers from the local community are essential for a small Rotary Club like ours to accomplish its fundraising goals. Pierre Charest has been instrumental in the success of several of our events. 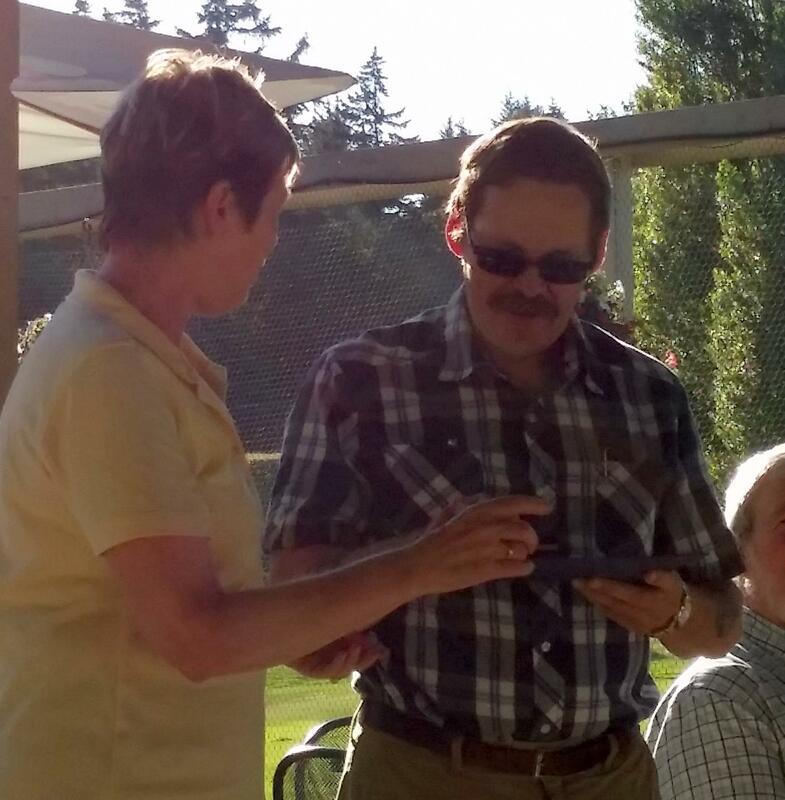 A special acknowledgement was awarded to Jacque during our summer social. 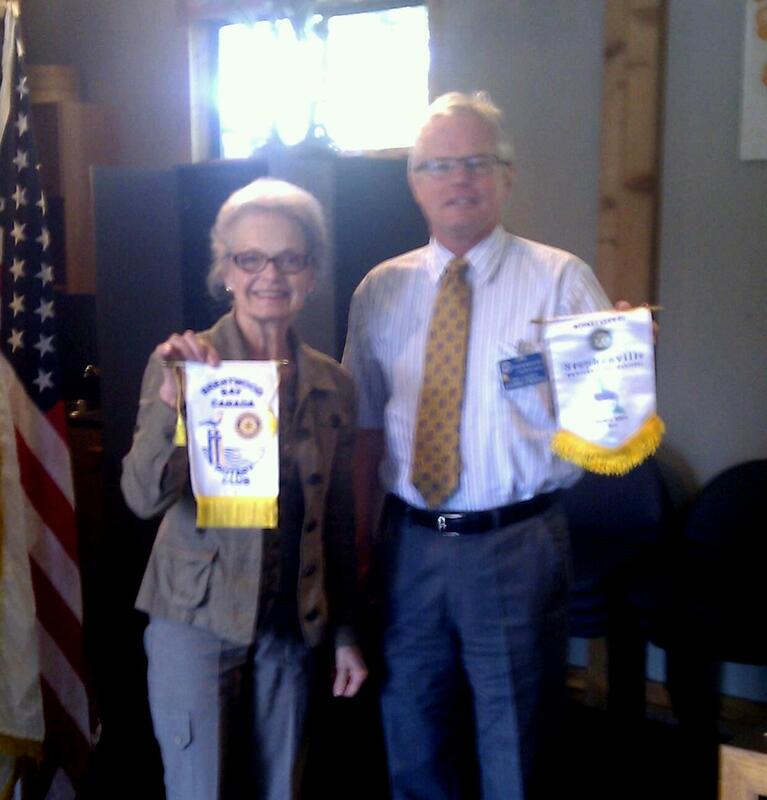 Our world traveler, Elaine, exchanging banners with a Rotarian from Adelaide. 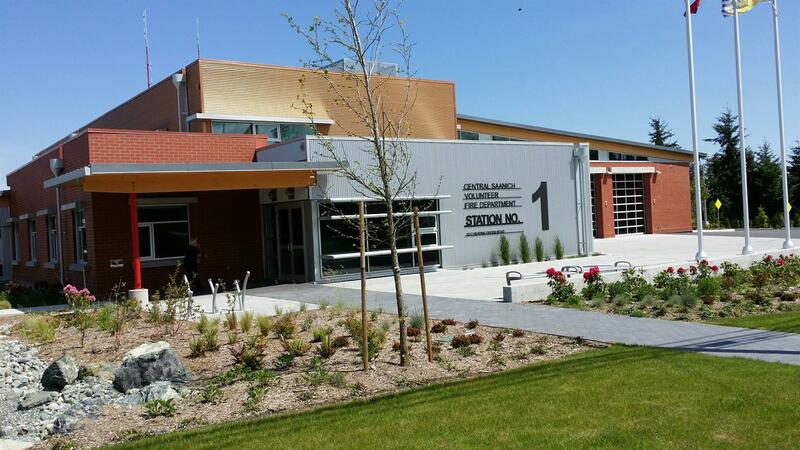 Thank you to the members of the Central Saanich Fire Department for allowing us to hold a meeting in their amazing new facility. 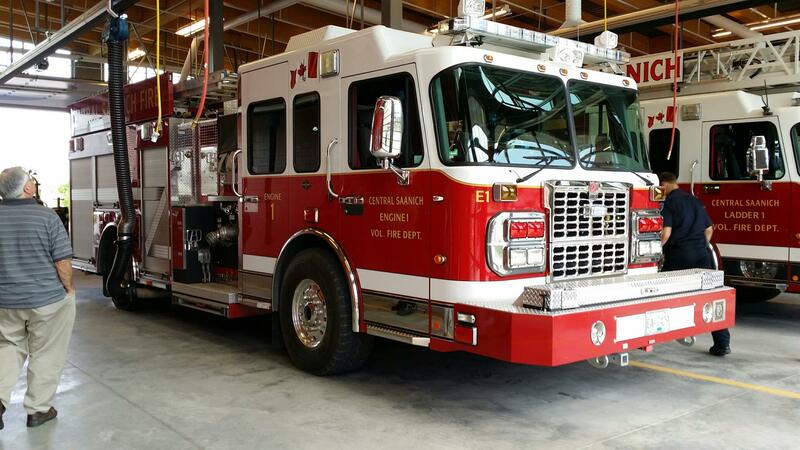 Club members were treated to a tour of the building and even got to have a close up look at the trucks. Much to Wendy's dismay, we were not allowed to slide down the pole. On the plus side, with the acoustics in that place our singing of the national anthem has never sounded better. The Club is always inspired to hear about the efforts of Garry Brooks with the African Community Project. Today Garry's presentation included pictures showing how our funding has supported his efforts to effect tangible change. 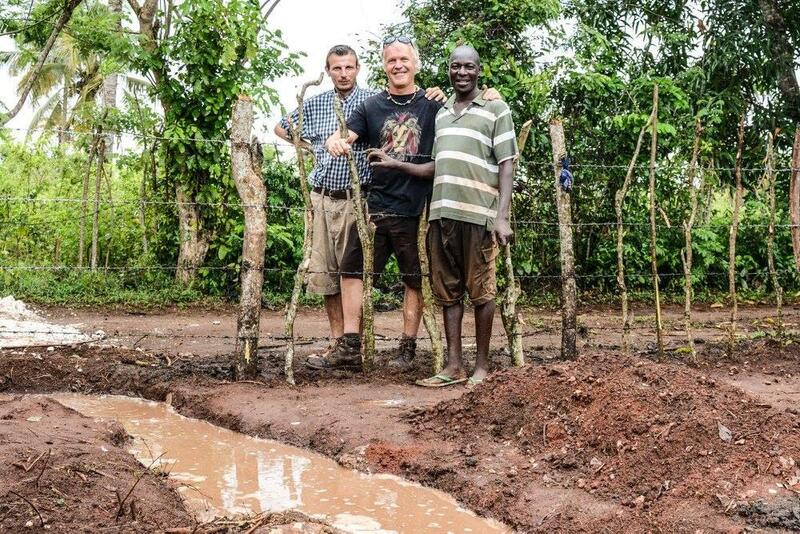 Felix, shown in the picture, is responsible for the distribution of millions of tree seeds for planting. His new bicycle will help him efficiently carry out his work. The Club also helped pay to have a roof put on a school house. We are thrilled to see the outcomes of our fundraising efforts and thankful that we have someone like Garry on the ground improving lives. The club members met at Ardmore Golf Course for 9 holes, a great catered supper, to show our support and appreciation of Gary as he enters his second term as Club President, as well as celebrate another successful Fall Fair. It was a lovely evening with door prizes and toasts. Not to mention one member even managed to score three under par! 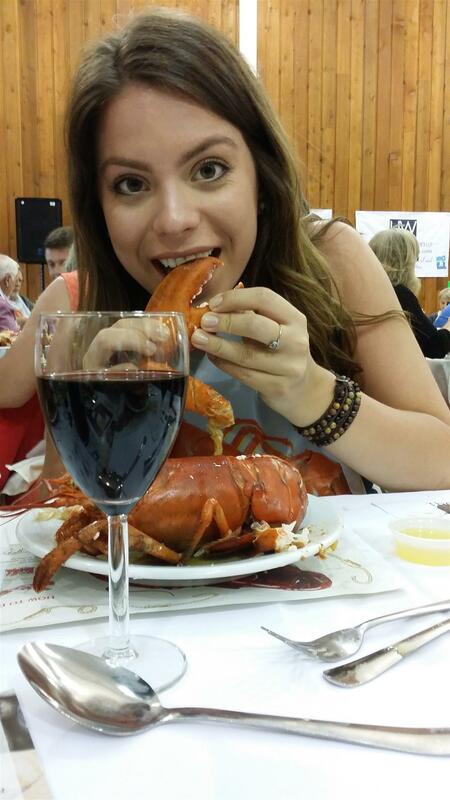 Lobsterfest - So Much Fun We Should Do It Again! Our 2013 Lobsterfest fundraiser was so well received we've decided to join forces with the Saanich Peninsual Foundation and do it all over again! Michael Forbes and Lisa Marshall, radio hosts from The Ocean, joined the club's meeting today to be presented with a Paul Harris award. As a thank you for their significant contribution to the very successful Gala Night Out, held at Church and State this past May, a donation of $1000 was made by to the club to Rotary International Foundation in the couples name. As an added bonus, we were able to convince them to join us as the hosts of our upcoming Lobsterfest. Thank you Michael and Lisa for all you do in the community! Janet Smith, of the Stephenville Newfoundland club, joined us for our August 20th meeting. We learned a bit about Janet's club and community before exchanging banners. We enjoyed your visit and hope you come back to see us soon Janet! 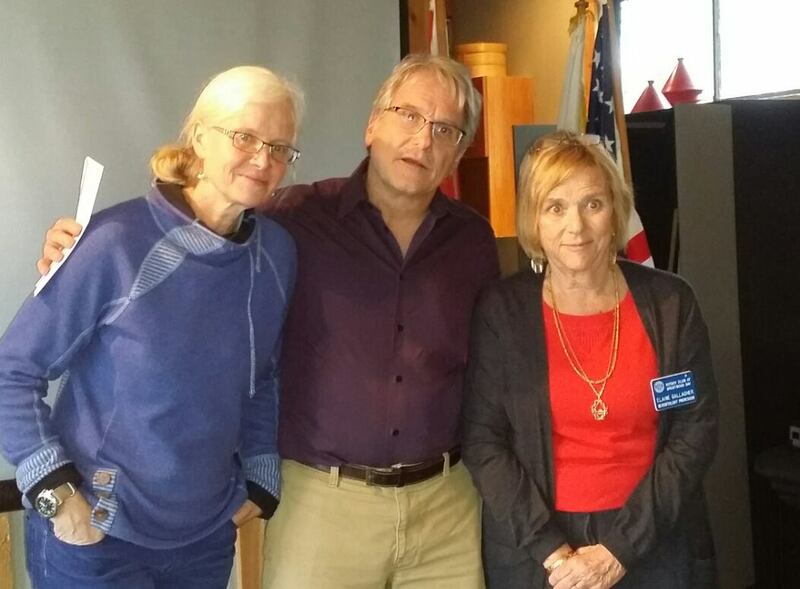 If you would like to attend a Rotary Club of Brentwood Bay, call Donna at 250-413-7051. We'd love to have you. Andy Anderson was presented with the Queen's Diamond Jubilee Medal to acknowledge his years of volunteer work. The award was presented to Andy by MLA, Murray Coell. Andy also was a recipient of the Queen's Golden Jubilee Medal in 2002. The club congradulates Andy for this prestigious honour. 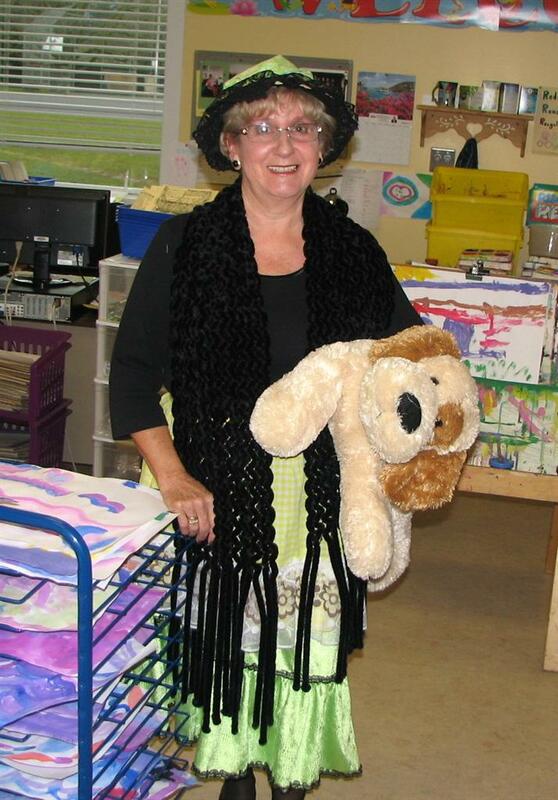 Wendy Halliday, aka Mother Hubbard, lead a troupe of volunteers from the Rotary Club of Brentwood Bay to the local elementary school where they read to children in support of literacy. On January 8th, 2013 our club was pleased to present Principal Shelley Hardcastle of Brentwood Bay Elementary School with 16 book vouchers. The school will award and motivate students to improve literacy. First Annual Gala Night Out a Success! 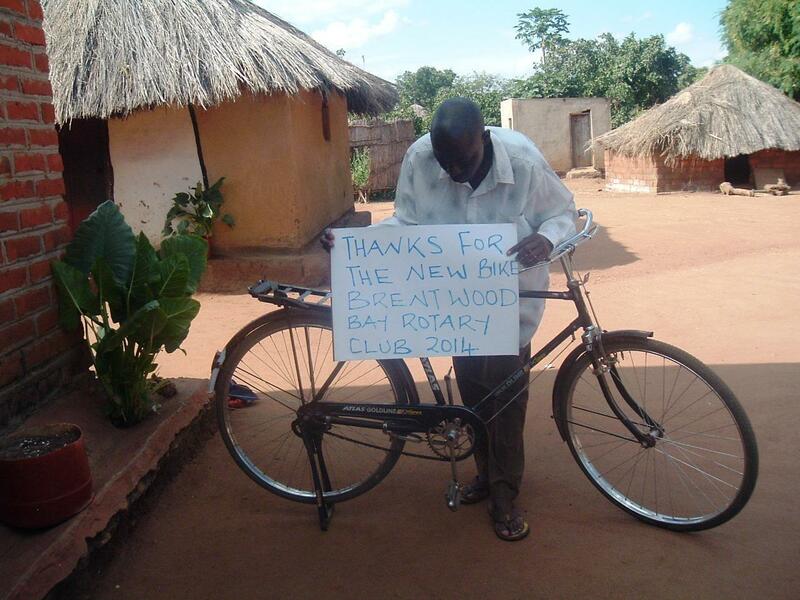 Rotary Club of Brentwood Bay Relocates to Zanzibar! Cheque Presented to Gary Brooks "African Community Project"
Generally we meet on the 1st and 3rd Tuesday of each month. Please check the calendar below for our exact meeting schedule.